Harold Lloyd (B-Boy) Parker, age 95, of Mangum, passed away at the Oklahoma Veterans Center in Lawton, Oklahoma on Monday, January 14, 2019 surrounded by his family. Harold was born October 1, 1923 near Hester, Oklahoma to Henry Leaton Parker and Amma Lillian (Gray) Parker. He was the baby brother to three older sisters, Viola known as "Pig", Juanita, and Frances who nicknamed him Baby Boy early on a name which stuck for the rest of his life, shortened to B-Boy. B-Boy attended school at Cityview, graduating in the Class of 1941. He was always happy to explain how his graduating class included himself and eight girls. Following high school graduation, he worked on the family farm with his father until Uncle Sam came to call with the draft in December 1943. He was shipped off to 18 weeks of boot camp and orientation in Texas before boarding a ship to Naples, Italy. During his tour of Italy, he got to see the Leaning Tower of Pisa, visit the canals of Venice and the ancient city of Rome, and spend the winter in the Alps during the campaign through the Po Valley. The troops in World War II traveled to Europe and back via ship, and B-Boy was not a fan of ocean travel. He told stories of the sea sickness experienced on the ships, as well as a dust storm blowing over the decks where they were sleeping at a point when they had been out of sight of land for days.Returning home through Fort Benning and Fort Chaffee, upon receiving his honorable discharge from the 363rd Infantry, he returned to farming near Mangum. Never one to have just one iron in the fire, B-Boy also moonlighted as a bouncer at the skating rink in Mangum where he came upon a girl from the Cummins Cafe, Maggie Leah Roberson, and they were soon married on November 23, 1946 at Wellington, TX. They moved to a farm near the Hester community, and then relocated in 1949 to a farm east of Mangum. In 1949, the US Army called again and B-Boy was called up from the National Guard to return to active duty service in Korea. He shipped out for that tour, leaving Maggie Leah, Amma Lois, and Harold Jr. to move to Mangum during his absence. In Korea, B-Boy served as a "Caterer II" which let him be close to the kitchen, but rarely the actual cook-a spot he was to maintain for years to come. 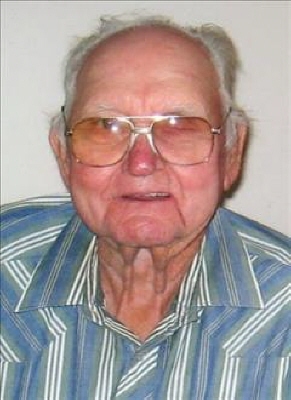 He returned home to Greer County in 1952. The family relocated to Frederick, Oklahoma for a short time after his Korean service, but returned home near Mangum in 1954, at which point B-Boy felt he'd traveled enough and "didn't need to leave Greer County again." He and Maggie Leah remained in Mangum for the rest of their 63 years together, raising four children in the community; Amma Lois, Harold Jr., Sherry Kay, and Sammy. B-Boy became very active in the Mangum Mounties during the late 70's and 80's with his grandchildren. He took care of the arena grounds with his tractor, participated in the many building projects for the 50th anniversary of the Mounties, and later served as president of the club. B-Boy was rarely to be found actually on horseback during the Mountie years, but he was always there to handle, haul, and care for the horses. His association with the Mounties began after he borrowed two Shetland ponies and a two seated cart, but led him to spend years trading horses in the area, making weekly trips to the Mountain View horse sale for many years to keep the commerce moving.In his later years, B-Boy continued to farm and trade horses in Mangum where he became well known for his daily trips through town that would back up traffic on Louis Tittle as he crept past the bank, The Enterpriser, and around to the farm to check on the horses. After Maggie Leah passed away in 2009, B-Boy remained home with support from his family until his health began to fail in 2017 when he moved to the Oklahoma Veteran's Center in Lawton, Oklahoma where he resided until his passing this week. B-Boy was preceded in death by his loving wife of over 63 years, Maggie Leah, his parents, Henry Leaton and Amma Lillian Parker, three sisters; Viola (Pig) Melton, Juanita Hunter, and Frances Hughs, one son, Sammy Parker, one son-in-law, John Beaver, and one daughter-in-law, Bonnie Parker. He is survived by three children: Amma Lois Beaver of Mangum, Harold Parker, Jr. of Oklahoma City, Sherry Kay Parker of Oklahoma City; five grandchildren, John Beaver, Jr. of Edmond, Sheila Duren of Edmond, Kris Beaver of Oklahoma City, Brice Parker and wife Joy of Mangum, and Chase Parker and wife TeâOnna of El Reno, as well as seven great-grandchildren, Kayleb Beaver and wife Kayla of Moore, Oklahoma, Hunter Duren and wife Sarai of Republic, Missouri, Parker and Jack Beaver of Edmond, Garrett Giddens of Edmond, Mason and Tyson Parker of Mangum, Trystyn Beaver, and one new Parker on the way in the spring in El Reno. He was just short of seeing his first great-great-grandchild also due this spring to Hunter and Sarai in Missouri. He is survived by a great host of friends and relatives throughout the Greer County area.B-Boy always enjoyed being with his family, and was especially fond of time with the little kids. He always had treats for them and would take them to see the horses or stop and talk with them on the porch or around town. B-Boy will be laid to rest next to Maggie Leah at Roselawn Cemetery in Mangum, Oklahoma following services at 2:00 PM on Friday, January 18, 2019 at the Church of Christ in Mangum. To send flowers or a remembrance gift to the family of Harold Lloyd Parker, please visit our Tribute Store. "Email Address" would like to share the life celebration of Harold Lloyd Parker. Click on the "link" to go to share a favorite memory or leave a condolence message for the family.